To increase the number of users of the bicycle path, especially children riding their bikes to school, rather than being taken by car by their parents. This is a project that stands on three equally important foundations, namely, ownership by co-creation, a robust and future-proof technical solution and an innovative and interactive lighting installation. Ownership of the bike path within the user group is crucial to the overall success criteria: That more students take the positive option of using the bike path. User involvement both brings good idea into play, and, on the other hand, provides users with a sense of ownership, which will improve the likelihood of a successful implementation. This has also been reflected in the development work, where users and other stakeholders have naturally been consulted. The technical solution is based on a robust architecture that is flexible, so it can be further developed in the future, if or when this becomes an issue. It could, for example, be in connection with users themselves learning how to program. 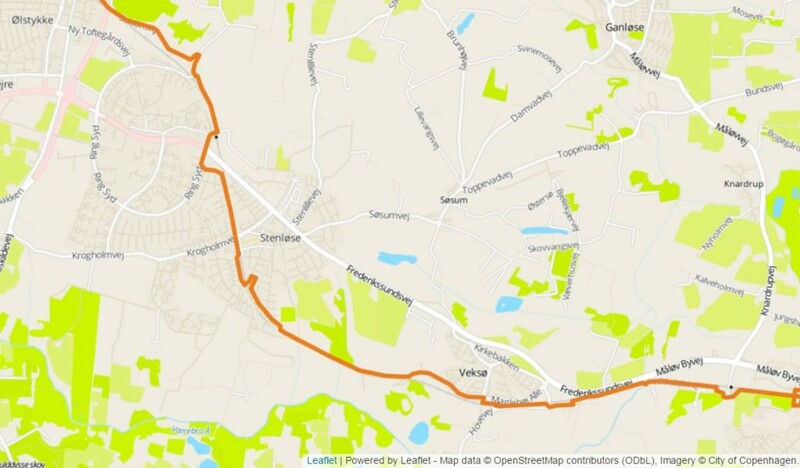 It could also be in relation with the further development of apps or further development of other zones along the path. The architecture consists of an RFID reader that can read a tag placed on a bike helmet, and then send a message via a 4G or 3G router to a web service. Then one or more specific instructions are sent to the IoT devices. These devices can control an IoT installation, whether i is about light, engines (movement), speakers, etc. The cloud platform provides the ability for the users to set how the lighting installation should function, so the experience will be configured personally. The web hook from the reader’s controller must only contain unique IDENTIFIER info about the tag. 2 zones are set up (A and B). In zone A, RFID readers are used on both sides of the zone. In zone (B) only one RFID reader is set up. (This is because power is not available on both sides of zone B). 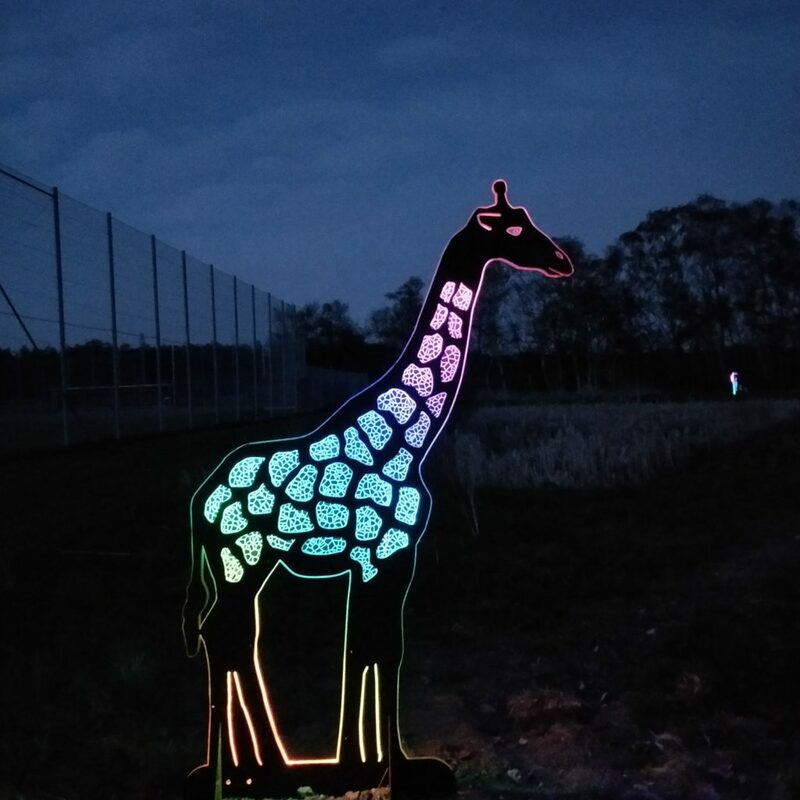 Users can set various preselected parameters that determine which animals will light up, in what colours and how they will be lit. Depending on how a user sets these parameters, it will provide unique experiences for the user. The user interface can be developed at any time, if an app or another graphical user interface (GUI) is desired. In addition, the technical installations will be created in such a way as to easily implement additional zones, whether it be light installations or other interactive elements to be activated. This means that if you want underlying mood music or movable installations, this can easily be implemented, as a further development of the existing system. Finally, the system can provide anonymous statistics about how many people use the bike path. Thus the system can be used for effect measurements on other actions that contribute to more students riding their bikes. The design of the lighting installation is to a certain extent open, as users themselves help to shape the final design. However, the basic vision is to create an installation that will, several years into the future, still be a mood-inducing path for the users. This long-term durability is achieved through a subtle design, where quiet shifts in terms of changing colour shades light up the installation design. Thus the total expression could be varied in countless combinations, so it will over time appear a bit different to the user since the last time they passed by. The visual solution is changeable and understated. The user should experience variation in shades and details every time they pass the installation. The solution must be durable and evoke a pleasant mood, creating a sense of security for the user. At the same time, the plate’s two-dimensional nature is challenged by the application of shifted layers in between which LED lights can be mounted. This adds a depth of texture to the installation which can be used across various motifs. In addition, the light-transmitting properties of acrylic will be brought into play. Acrylic is often used as an optical fibre in various decorative lamps. As an innovation, this project will use acrylic in a sandwich construction consisting of acrylic and Corten, where the holes in the metal will – through the acrylic plate – light up, while still transparent. This effect can be used to give the giraffe its spots, the tiger its stripes, etc. RGB LED panels or RGB LED strips will be used as the light source. They can be mounted flexibly and provides a wealth of opportunities for different colour shades, intensities and shifts with soft transitions. Many of these LED solutions even allow each individual diode to be controlled, making the possibilities of variation in colour play infinite. In this context, the layered plates and sandwich constructions are optimal, since the LED strip can be fitted between the layers, thus partly protected against the weather, partly against vandalism. 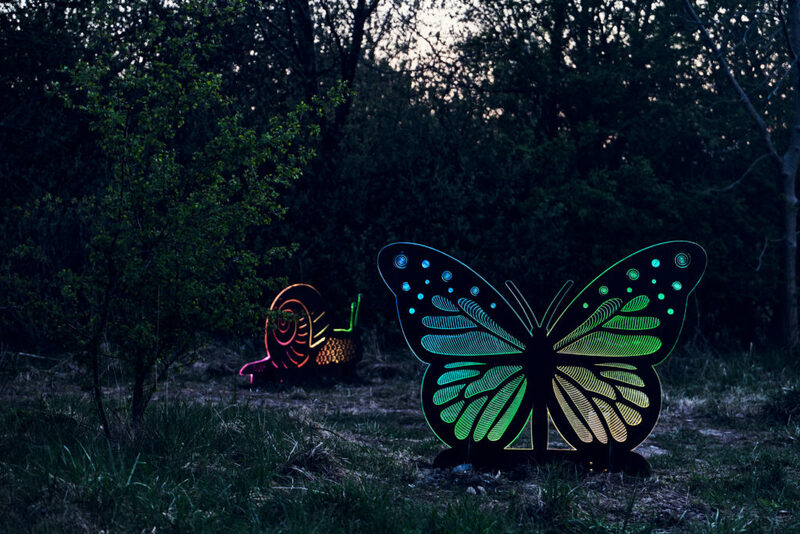 The path runs between Stenløse & Veksø, with several light installations along the route.